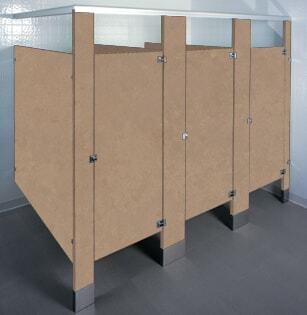 Plastic Laminate bathroom stalls are available in hundreds of designs ranging from classic woodgrains to solid colors. Very economical with a highly durable plastic surface that will not rust or dent. Dirt, grease, and cosmetics will not penetrate surface. Solid plastic partitions solution for broken, dented, rusted and vandalized partitions. 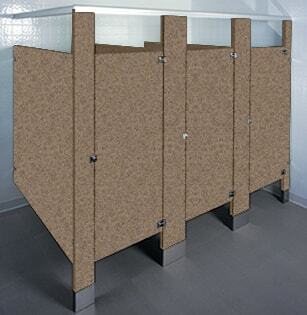 Plastic laminate bathroom partitions and urinal screens provide unmatchable design flexibility with hundreds of different colors and patterns being available. Many consumers choose plastic laminate partitions when aesthetics are essential and cost is a consideration.Partitions are manufactured with high pressure laminate that is bonded under extreme pressure to a solid impact resistant particle board core. These surfaces will not rust or dent and are impervious to dirt, grease, and cosmetics. Plastic laminate toilet partitions, or P-LAM as it’s commonly known in the industry, are available from One Point Partitions and provide for an economical choice with a virtually unlimited option of colors. Laminate surfaces have been used in homes and businesses for many years, and while most people are familiar with them as a countertop or furniture finish, plastic laminate also produces a versatile restroom divider material. Like the baked enamel steel materials, P-LAM is also available in the following mounting styles: floor mounted overhead-braced, floor braced, ceiling hung, and floor to ceiling hung. 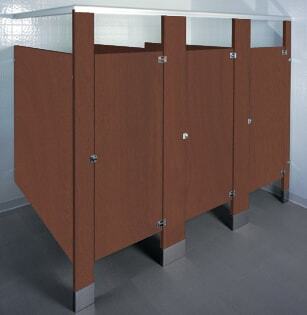 We also offer 48-hour shipping on toilet partitions from several manufacturers. Plastic laminate bathroom stalls is another great material for customers on budget and includes around 45%-47% recycled content. Many are GREENGUARD Certified for low chemical emissions and free of urea-formaldehyde, a known air-quality contaminant. While the material is corrosion resistant, it is not moisture resistant, and therefore not recommended for pools, health clubs, or any other high moisture environments. Facilities with graffiti and vandalism problems should not choose P-Lam toilet partitions this material as it can be scratched, carved, and etched into. Plastic laminate is the perfect choice for an office building, doctor’s office, or restaurant that desires a custom but affordable look.